Simeon Peterson, known as "Mr. Pete," in 2009. 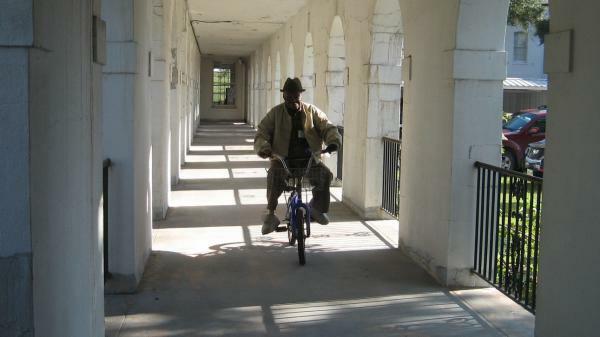 Patients at Carville leprosarium often used bicycles to get from building to building, which were connected by covered passageways. 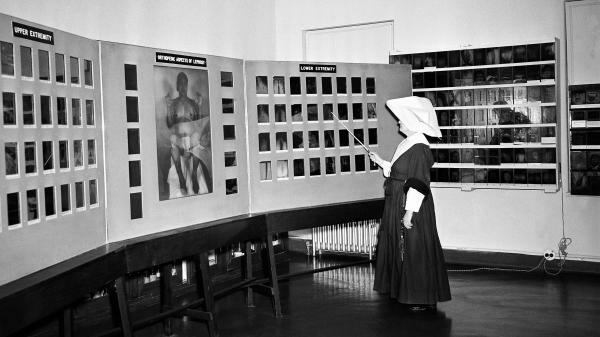 Sister Hilary Ross, a biochemist and clinical photographer at the Carville leprosarium, looks over an exhibition of color photos in 1952. 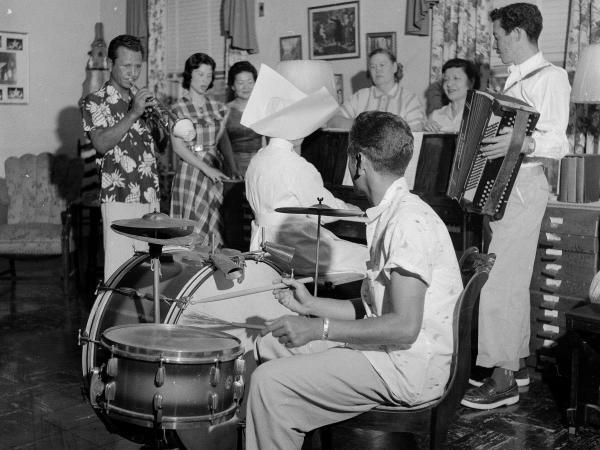 Patients at the Carville, La. hospital enjoying a musical evening around 1955. Peterson in May 2016 at St. Clare Manor in Baton Rouge, La. 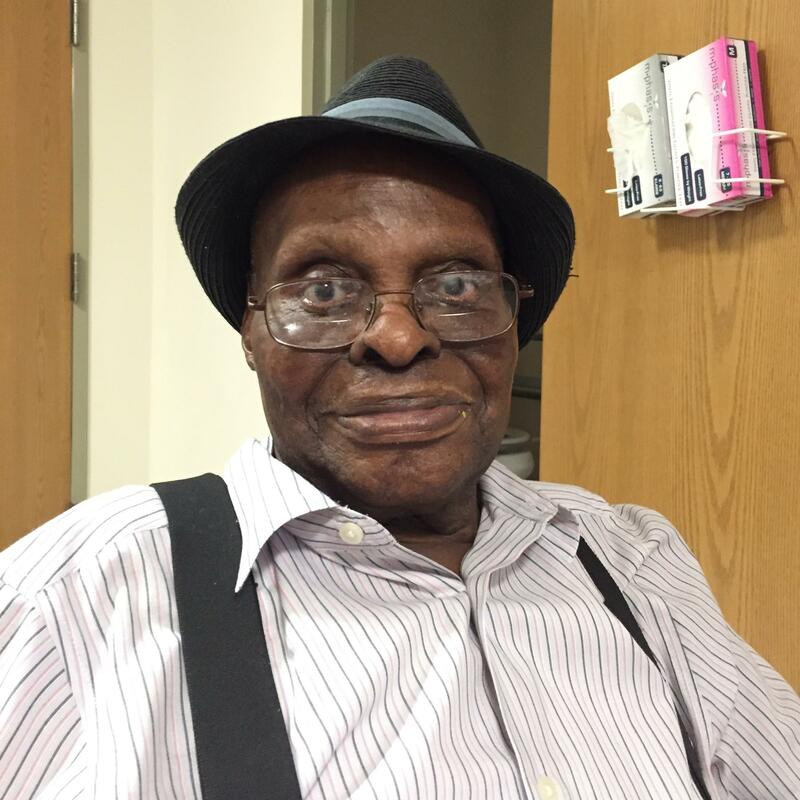 He lived his final days in the nursing facility with a few other elderly patients from Carville. Simeon Augustus Peterson, called "Mr. Pete," was not famous, but he was a much loved fixture in the small, isolated Louisiana community where he spent most of his life. And where he eventually became its emissary to the outside world. Mr. Pete died earlier this month at 89 after suffering from cancer. He spent 83 of those years living in institutions. When he was only six years old in the Virgin Islands, he was diagnosed with Hansen's Disease, commonly known as leprosy. In those days — the 1930s — that meant a life sentence, stuck behind fences and gates, shut off from family and friends, stigmatized and shunned. "If they know you have the disease, they treat you bad," he recently said of that time in his life. "They don't want to have anything to do with you." It was scary for the little boy, confined to a leprosy hospital on St. Croix. He was frightened he'd become like some of the older patients who had lumps on their faces, although he never did. He was also lonely. His mother visited once a month, but wasn't allowed to touch him because of a misguided belief that the disease was highly contagious, which it is not. Ninety five percent of humans are naturally immune. When the opportunity came in 1951 for Mr. Pete to transfer to the U.S. leprosarium in Carville, La., where he could get better medical care, he jumped at the chance. At age 23, he was eager for adventure, and needed surgery for his hands, which the disease had slowly crippled. The Carville hospital, which housed about 400 patients when Mr. Pete arrived, was located along the Mississippi River, on a sprawling former plantation dotted with magnificent oaks and pecan trees. He would still be confined, but there was also a vibrant patient community there, with movies and mardi gras parades, dances and even a newspaper. For Mr. Pete, there was also a purpose. He worked at the hospital as an elevator operator for 60 cents an hour, transporting patients and doctors to appointments and therapy sessions. Later, he got another job pushing those confined to wheelchairs around the sprawling complex, and helping blind patients, of which there were many, maneuver their way along the miles of screened in walkways that connected Carville's buildings. Mr. Pete was also often one of the first people new patients met when they arrived at Carville, frightened and confused. He would try to put them at ease, assuring them they'd be okay. A cure for Hansen's Disease was discovered and perfected in the last half of the 20th century. But when the government decided to shut the hospital down in 1999, Mr. Pete was among those who refused to leave. Like other patients who had been confined for so long — often against their will — he had nowhere else to go. He paraded in protest, carrying a sign on his bike that read: "I don't want to leave. This is my home." The government relented, and allowed those who wanted to stay to remain under its care. That's when Mr. Pete got his final job, as ambassador of Carville. He would greet visitors at the National Hanson's Disease Museum on the grounds, and talk to them about the long misunderstood disease and the lives of those who got it. He told the curious and concerned that there was no reason to be scared, pointing out that no doctor or nurse who worked at Carville in over 100 years had ever contracted leprosy, and that the disease was now easily cured. Museum Curator Elizabeth Schexnyder called Mr. Pete a "gem." She said children especially were mesmerized. He was witty and charming, a real character who could be seen bicycling around the complex, wearing his signature suspenders and coordinated hat. I met Mr. Pete last year at a nursing home in Baton Rouge, where he and a handful of remaining patients had come to live out their final days. He was still giving media interviews, talking to journalists from around the world about living with leprosy and the stigma that persisted long after the disease was gone. What struck me most was that a man who had what many would consider to be a tragic life, thought his life was pretty good. He was almost indignant when I asked if he'd ever wanted to leave Carville, to be free, to go out on his own, once he was cured. "Nah. This is my home 'til I die," he said. While he might have been a pariah in the outside world, inside Carville he could be himself. He didn't have to explain his deformed hands. No one recoiled in fear. Why be depressed, he asked? He chose to be happy. Mr. Pete died this month, outliving everyone else in his immediate family. And he got his wish, to be buried with members of his other family, under the pecan trees at Carville.